The vog has returned with a vengeance to Big Island’s east side and looks to hang around through Wednesday of next week. Weather patterns have been anomalous this year, in my opinion, due to the el nino condition in the Pacific. Even though a few fronts, including a cold front, will be moving through in the next few days, it will not be enough to bring significant rain and strong trades. Vog, or volcanic haze, is predicted to linger through next week. As a rule of thumb, vogis at a pretty high level when visibility is reduced to a mile. Today it was right at 1 mile visibility here at the coast near Kalapana and reportedly worse up in Pahoa, Kea’au and Hilo. You can read weather discussion at this site to see when it may be moving out of your area. In the winter of 97/98 there was a stong El Nino event in the Pacific and so far the weather is very similar to then – lots of very clear skies on the east side and little rain. 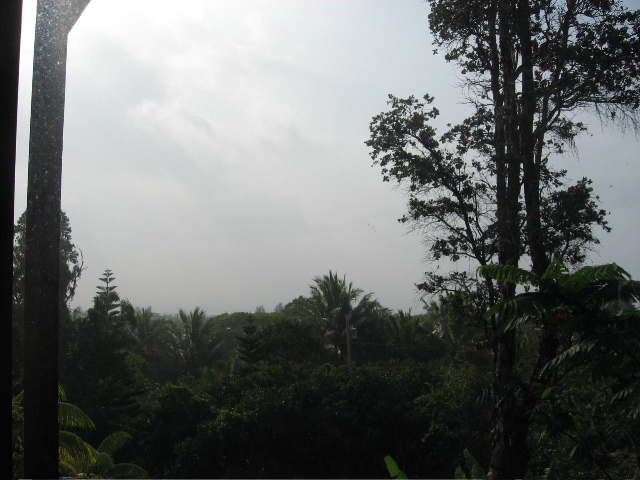 The vog wasn’t so bad then, only Pu`u` O`o was active, but I still remember many mornings which reminded me of the fog in the UK! The only real difference is that I don’t remember there being any big storms in December like the one we had a couple of weeks ago. PS. In 97/98 there was little snow on Mauna Kea’s summit. This seems to be true so far again this year. There has been snow but unlike recent winters it’s melted very quickly. This time last year the summit was covered in thick snow which didn’t melt for weeks if not months – same for the last 2 or 3 years before as well. Thanks for the comments, Tom. I’ll bet it looks interesting from your perch up on the Summit. What’s really irritating down here is that not only do we get the vog, but it blows the “laze” over from the ocean plume. I’d say there is an interesting mix of chemicals in the air. I’ll be glad when Spring comes and the El Nino goes away. Until then, hopefully we won’t get anymore wild storms like we’ve had the past couple of months! Actually, I haven’t been on the summit for quite a while! I’m seeing the same thing as you. Just a quick anecdote – in the 97/98 El Nino event I’d only just moved to my place in HPP and my long-time girlfriend from the UK arrived for a visit. We spent a few days in Kauai and then came back here for her first look at my place. I’d warned her that we’d had no rain and my catchment tank was low and everything was dying in the garden. The day we got back to the Big Island the drought broke and it rained for the rest of her vacation here. We broke up shortly after that – I blame the rain! It’s so long ago now I can’t remember the actual dates, but think the drought broke in March/April. It’ll be interesting to see if similar things happen around the same time again. Yes, it will be interesting. Everything I’ve read compares this El Nino to the one in the late 90’s. I’m sure we’ll be in for a wet time once it breaks. I hope it’s before March/April though! Otherwise, we’ll all be ordering up some water for delivery! Funny story. Yep, people have a totally different vision in mind when they think of Hawaii – and it doesn’t include torrential rain! PS.. does the VOG make it hard to breathe for asthmatics? Is it worse than the big city pollution on a hot humid day with the air stagnant? We get warnings here for air quailty indexes. In the summer, when it’s in the 90’s, no air, the index goes up to extremely unhealthy. I can’t breathe outside then. Hope it’s not that bad there. I’m looking forward to some clean fresh air and water. In many ways vog is worse than mainland pollution in that it’s so concentrated with sulphur dioxide. It burns the eyes, nose and throat and does cause asthmatic reactions in people who are sensitive. On this side of the island, MOST times it is clear with the cleanest air in the world. But during a wind shift, it’s really heavy with vog. Hard to say what it will be in May. The problem during the winter (and an El Nino one at that) is the trades are often interrupted. When they blow then the east side of the island is generally clear of vog. No promises, but it’s likely that in May the regular trades will have returned and the east side of the island will be relatively clear of vog. At least that’s what I’m hoping for!